...went to another baby shower for our little girl, this one hosted by my mother-in-law! 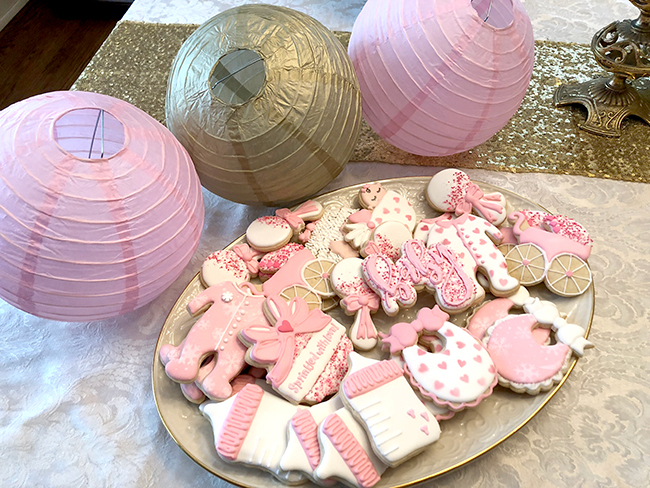 How sweet are the little cookies she got from Cookie Camelot?! The shower was great, nice and chill with lots of snacks and sips and conversation but nothing in the way of games - just the way I like them! I can't believe baby girl is just five weeks away now - so crazy! We spent the rest of the weekend getting things in order and pretending that we definitely know how to fold up the stroller. ...met a bunch of friends out for bowling at Burnt City - well, at least hanging out at Burnt City haha. You know I wasn't getting anywhere close to the lanes, what with being 8 months pregnant and my pregnancy-related carpal tunnel ;) But, the bartender didn't laugh when I ordered a Shirley Temple at a brewery, so I was a happy lady! ...spent a lot of time cuddled up on the couch hiding from the snowstorm and then the below zero windchills. I ended up watching the Fyre Festival documentary on Netflix which I thought was fascinating and watched the first episode of Yummy Mummy's which is so bad but also so good hahaha - perfect if you're a Bravo fan!